Mario's Super Picross, also known as Mario no Super Picross in Japan, is the first sequel to the Game Boy game, Mario's Picross, and can be played on the Super Famicom. After the commercial failure of Mario's Picross in the West, this sequel was released only in Japan in 1995. The game plays much the same way as the first, except Wario appears in it and presents his own set of special rules, which also return in the sequel. In 2006, it was released on the Wii's Virtual Console in Japan. The game saw its first Western release in 2007 on the Virtual Console in the PAL regions, albeit untranslated. It was later released on the Wii U Virtual Console in 2013, and the Nintendo 3DS Virtual Console in 2016, in both Japan and the PAL regions. However, subsequent Picross games of this era were never released in North America, most likely due to the poor reception of Mario's Picross on the Game Boy. Gameplay of a 10x10 puzzle. Picross is a logic puzzle game in which the player uses a chisel and rock hammer to uncover pictures. In order to reveal the picture, number clues are given to show how many squares go in each row or column. For example, a "5" horizontally means that there are 5 consecutive marked squares somewhere in that respective row. If there is more than one number, they all appear in that line in their respective order, but there must be at least one blank square between them. The player can also label squares with an "X" if they believe the square should not be marked. Labeling squares with an "X" serves no purpose in the solution of a puzzle, and is only used to assist the player. New to Mario's Super Picross is the ability to mark the hint numbers along the sides of the grid at will, preferably as each consecutive group of squares is solved on that line inside the grid. There are two sets of puzzles, each divided into several levels. In Mario's set of puzzles, the player is given a time limit. In puzzles with time limits, the player is allotted 30 minutes to complete the puzzle, and is penalized for time for each wrongly marked square; 2 minutes for the first mistake, 4 minutes for the second, and 8 minutes for each mistake thereafter. At the start of the round, the player has the option to use a hint roulette, which cycles through the grid to completely reveal one row and one column. Once started, the player also has the option to use another hint roulette at the expense of 5 minutes deducted from the timer; this can be used multiple times as long as there is enough time remaining. When the player runs out of time, the game is over and they must restart the puzzle. After clearing the first level of Mario's puzzles, the player is granted access to Wario's puzzles. In Wario's set of puzzles, there is no time limit and the player isn't notified of mistakes or given any hints, making the puzzles harder to solve. There is still a timer, however, it only increments to show the amount of time taken on a puzzle. There is a new option in the start menu, exclusive to Wario, called "? Start"; a guessing mode where the player halts progress on the puzzle and can make temporary marks on prospective squares, which can sometimes be necessary due to the lack of hints and the complexity of Wario's puzzles. The player can decide at any time if they want to cancel the guessing mode and remove the temporary marks, letting them continue from a state prior to entering this mode. If the player correctly finishes the puzzle while in this mode, the puzzle is completed as normal. Each set has 11 levels with 12 puzzles each, except Wario who has a hidden twelfth "Ultra" level with eight puzzles, which is unlocked by clearing Mario and Wario's special level. After Wario's ultra level is cleared, EX puzzles are unlocked for both Mario and Wario. There is a total of 300 puzzles in the game and puzzle sizes range from 5x5 up to 20x20 and 25x20, the latter being new additions to the series. A two player mode exists in the game as well. By performing any input on a second controller, a second player is entered in to the game, and players can then solve puzzles cooperatively. 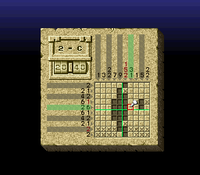 This feature would later return in Picross 2, Picross NP, and Picross S in which players can cooperatively solve puzzles or compete to fill the most squares. 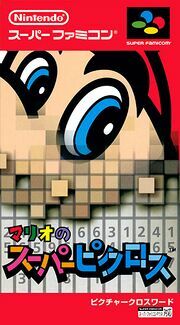 For this subject's image gallery, see Gallery:Mario's Super Picross. For a complete list of media for this subject, see List of Mario's Super Picross media. The rendered resolution (left), and the output resolution (right). Mario's Super Picross utilizes a "high resolution SD mode". While still constrained to the 224 lines of standard definition TVs, the horizontal definition of the images is doubled to 512 so that pixels twice as thin can be displayed. In order to better show such images on modern displays with square pixels, the horizontal lines need to be doubled to restore the apparent aspect ratio. This mode is only used for screens that use text to allow a higher level of detail to display the kana characters. The puzzles themselves and the menus are in the standard Super Famicom resolution, 256x224. ↑ Nintendo UK. (October 31, 2016). Mario's Super Picross - Nintendo eShop Trailer (New Nintendo 3DS). YouTube. Retrieved October 31, 2016. Donkey Kong Country • Donkey Kong Country Competition Cartridge • Donkey Kong Country 2: Diddy's Kong Quest • Donkey Kong Country 3: Dixie Kong's Double Trouble! This page was last edited on February 12, 2019, at 14:56.